As reported by the AFR, AEMO released a report on Thursday investigating the rare 'islanding' of QLD and NSW's electricity supply on the 25th August 2018 when lightening struck a transmission tower supporting the QLD-NSW electricity interconnector lines. 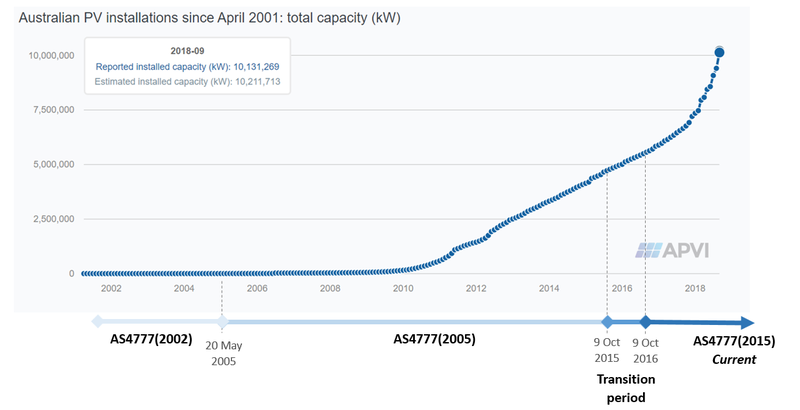 AEMO used Solar Analytics data in collaboration with the UNSW to understand the role of rooftop PV solar in the event. Naomi Stringer from the School of Photovoltaic and Renewable Energy Engineering at the University of NSW provides an overview of the data and analysis provided by Solar Analytics in collaboration with UNSW. Unexpected things happen all the time in the power system without serious repercussions. In fact, it's designed and operated to manage ‘credible contingencies’ without breaking a sweat . However the 1.95 million distributed solar PV systems now installed across Australia are dramatically changing the face of the power system and present both challenges and opportunities for managing power system security. Data on power generated and inverter type, collected by Solar Analytics provides a unique and valuable understanding of how distributed PV behaves ‘when things go bang’! An AEMO report released on the 10th January 2019 delves deeper into the very rare islanding of Queensland and South Australia on 25 August 2018. Through a collaboration with the University of New South Wales and AEMO, Solar Analytics data has provided critical insights into PV response during this event. 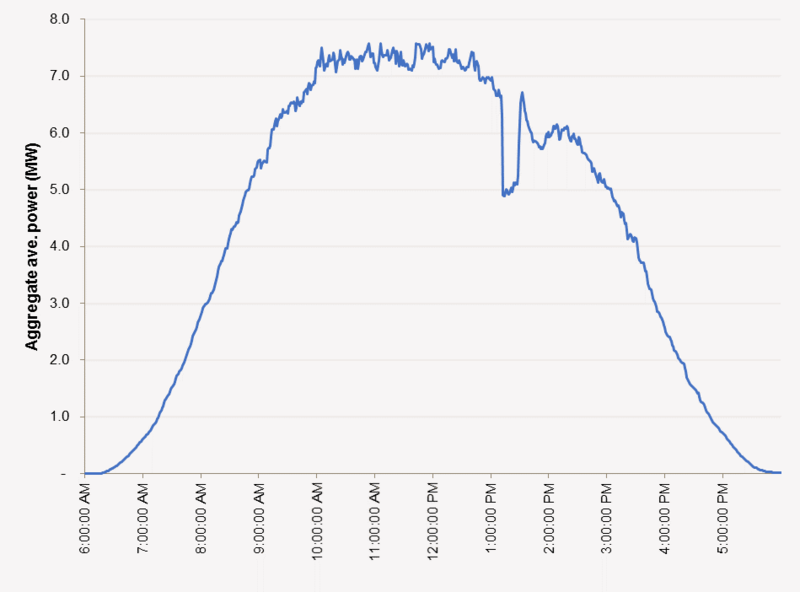 Excitingly, this data shows distributed PV responding to help keep the power system secure. To our knowledge, evidence of distributed PV supporting system security has not previously been seen. Here we will give you a brief rundown of what we expected to see occurring, what we actually saw, and where to next. What did we expect to see? Solar inverters  are required to respond to local power system conditions. Typically, this means disconnecting when frequency or voltage either go too high or too low, although there are also a range of other responses set out in the inverter connection standard, AS4777.2-2015. Importantly, this current standard includes an over-frequency droop response requirement, aimed at helping the power system to return to its normal operating envelope in events just like the one on 25 August 2018 . However, there is limited visibility over the 1.95 million PV systems currently installed and as installations continue to sky rocket, it’s becoming increasingly important that we can establish whether PV systems are actually doing what they’re meant to! It’s worth noting that this new standard was introduced in October 2015 and applied from October 2016, following a 12 month transition period in which the previous standard could still be used. As result, there are a significant number of systems operating under the pre-2015 standard, as well as under the post-2016 standard so response to major events will present a mixture of both . As with many things in the electricity sector, unpicking exactly what happened is not straight forward. The event affected all NEM regions, including Tassie. Since Queensland and South Australia were both exporting power before they islanded, these regions experienced over frequency, whilst all other regions experienced under frequency (for full details please see the AEMO report). The image below shows the aggregate of all the Solar Analytics systems (for individual systems with capacity of less than 100kW) in Queensland. There was scattered cloud across the state throughout the day, however the sudden ~26% reduction in output at the time of the event can be clearly seen. In fact, the Solar Analytics data shows us that a significant proportion of the monitored distributed PV systems in Queensland and South Australia appear to have helped return the system to its normal operating envelope by performing over frequency droop response. That is, when the frequency increased above 50.25Hz, they reduced output in a controlled and deliberate way. 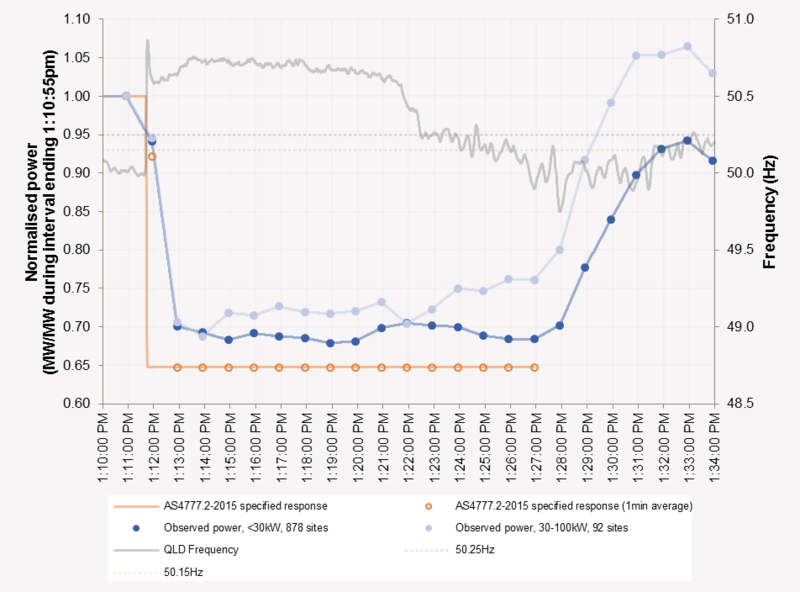 The graph below shows frequency in Queensland (grey) over the course of the event and the ‘specified’ response (orange) of an inverter if it responded as per the standard. Looking at the normalised aggregate of post 2016 systems , the operational data from Solar Analytics (blue) shows a response profile very similar to the orange profile. This is great news! Because it suggests that distributed PV can assist with maintaining power system security. However, unfortunately not all systems showed this response. In fact, when we look at individual PV systems instead of looking at them in aggregate, at least 15% of post 2016 systems in Queensland appear to have not followed this specified response profile. Even more concerning, in South Australia at least 30% of post 2016 systems appear to have not behaved as required. So the question is then, why did these systems not respond as we expected? The answer is not yet clear, but it will come as no surprise that having visibility of PV is increasing our understanding and will likely be key to managing the power system of the future. What about the states which experienced under frequency? In both New South Wales and Victoria we saw PV reduction following the event. In New South Wales there was both under frequency and also a significant voltage disturbance in the north east of the state. Therefore, it’s likely that some PV was responding to voltage disturbance as well as frequency. When voltage disturbances occur it can be possible to see a spatial pattern in the response. This is because the depth of voltage disturbance is broadly expected to be more extreme close to the disturbance and less extreme further away . 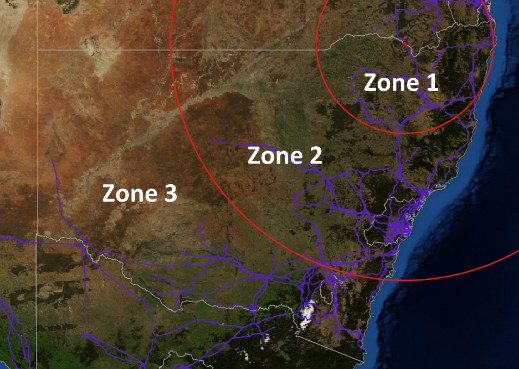 In this case on 25 August, there was a clear spatial pattern across New South Wales showing that a higher proportion of PV systems disconnected close to the source of the voltage disturbance (in zone 1) and a smaller proportion disconnected far away (in zone 3). Therefore, it’s likely that at least some PV was responding to the voltage disturbance . This type of analysis emphasises the importance of having a substantial data set, as it is not possible to show such trends with only a handful of sites. As noted in its report, AEMO is undertaking a broad program of works in this space. Whilst change can present challenges, this event also shows the enormous opportunity at hand. Inverters can provide fast and controlled response to events, meaning there is potential for distributed PV to aid with power system security into the future. Critically, the analysis also emphasises the importance of operational data along with the tools for analysing such data. Through an ARENA funded project led by UNSW and AEMO , the collaboration with Solar Analytics has been key in building the most accurate picture we can of PV behaviour during this major system event. However there remains plenty of work to be done. 2. Inverters convert DC to AC power and are typically the link between your PV system and the grid. 3. An international standard IEEE 1547 was released in April 2018 which includes further requirements to those listed in AS4777, including voltage and frequency ride through capabilities to help handle disturbances. 4. To further complicate matters, requirements set by local network service providers may differ slightly to those in AS4777, and additional or different requirements again may be applied based on the installed PV system capacity. For instance, typically systems over 30kVA are subject to different requirements to those below 30kVA. These requirements have also evolved over time. 5. Installed after the current AS4777.2-2015 standard came into effect. 6. This is very general! There are a large number of factors which influence voltage conditions across the network after a disturbance. What a great article. Slowly but surely a factual picture emerging less all the FUD.